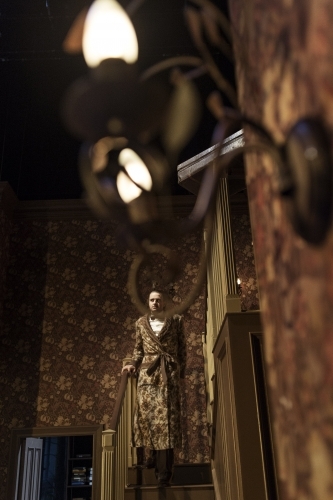 What’s you impression of the first ten minutes of Hedda? Probably not much, right? A pretty run-of-the-mill expository conversation between Jörgen Tesman’s aunt, Juliane, and his housekeeper Berte. Here, in Jan Bosse’s brand new staging for the Thalia, it is one of the funniest things I’ve seen on stage all year. The curtains (a kitschy effect in themselves) open onto a large brown room with the ugliest wallpaper you’ve ever seen. Berte, played here by Julian Greis, looks more or less exactly like Mark Gatiss playing Joan Sanderson, while the short, serious, Patricia Hayes-y Karin Neuhäuser as Juliane is wearing a brown and orange top with such extravagantly frou-frou-ed sleeves that you’re giggling before they even start speaking. There is such an elaborately overdone atmosphere of camp and bad taste that it’s very hard not to just keep laughing out loud. When Tesmaan (Jens Harzer) arrives, he looks, from where I was sitting, like a young Bruno Ganz doing a John Cleese impression, with added bits of Tommy Cooper. Something you notice when such broad comedy is inserted into this scene is how cleverly Ibsen makes you want new stuff to keep happening. This whole set-up – campery or otherwise – is all about setting the audience up to regard Hedda in something like the same light as the other characters on stage: this idea that she is so beautiful, that she exercises such a fascination for and control over the other characters; that they are all in her thrall. And Patrycia Ziółkowska (completely unrecognisable from Die Brüder Karamasow) takes set-up and absolutely knocks it out of the park. Where all the other characters seem to be stuck inside their mad physicalities in a 70s sitcom, Ziółkowska stalks in like Louise Brooks in Pandora’s Box. It really is an astonishing performance. She strikes exactly the poses, widens her eyes, exaggerates facial expressions in that silent-movie acting style, that whole lost language of expressionism is suddenly reborn. It’s just amazing to watch. And hilariously jarring with the rest of the set, characters and concept. Tesman is wearing a dressing gown so brown that when he stands too close to the wallpaper his body seems to disappear, chameleon-style. Ziółkowska’s Hedda, meanwhile shimmers in an iridescent black and silver gown. Richter Brack (Daniel Lommatzsch) is a dead-ringer for a young Derek Jacobi playing a metrosexual David Beckham-alike, in a red, raw-silk, seventies-cut suit. Perhaps slightly disappointingly, Lövborg is also dressed up in a seventies suit, a bit scruffier, and more down-at-heel than the others, perhaps ironed into this conformity by Marina Galic’s slender, brown velour trouser-suited Frau Elvstedt. Another fascinating aspect of the production is the energy with which all the characters are attacked. I’m a bit used to seeing Fr. Elvstedt written off as a bit of a cardigan-wearing frump, often as a deliberate visual contrast to a more conventionally “glamorous”, “pretty”, or “beautiful” Hedda. Seeing her also played by such a striking actor, albeit one who still contrasts totally with Ziółkowska, is a bit of a revelation. But every character here seems to be playing the most attack-y reading of their lines possible. Immediately Hedda and Elvstedt are fencing, not hedging; Brack is entirely, overt with his sexual designs on Hedda from the get-go; and all the while Greis’s Berte glides about like a ghostly, disapproving Mrs Danvers. This renewed attention to physicality also creates a real sense of how Hedda’s body itself is a site of conflict. In an early conversation when they are alone, Brack very violently and deliberately puts his hand between Hedda’s legs. The effect is completely shocking and appalling. 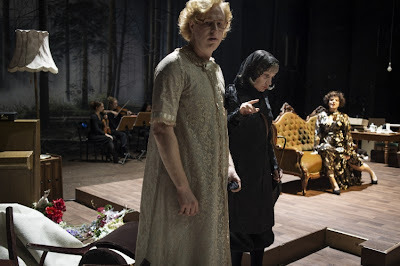 It even works without textual support as Ziółkowska’s face registers Hedda’s mortification, shame and disgust, and parallel realisation that there’s nothing that she can say to anyone, while Brack carries on as if nothing has happened. I’m not fully convinced it *all* works. There are moments when the pace drops, and then the mind wanders slightly (more possible and less helpful if listening to a second-language on which one needs to concentrate to understand). But part of me wonders if one can ever really recapture the thrill of seeing Hedda Gabler performed for the first time (without even knowing the plot, in my case). And after that, well, there a bit where you maybe find yourself thinking, yes, yes, this bit. Go on, get to the next bit. Is that bad? Can anything be done about that? What? (honest, open-ended questions). Some other bits, though – bits you equally know are coming – are still great, although I suppose I should admit that I found the bits which had been given a precise new bit of visual language the most satisfying: for example, when Hedda burns Lövborg’s manuscript she does so by dropping the pages through a trap-door in the stage followed by their burning cover. We then watch the orange light play on her face as the unseen flames eat the book. I did wonder *slightly* about the conceptual frame: yes, it’s bloody funny, and it makes you look at the play again, and it makes you appreciate anew the fine-tuned mechanics of Ibsen’s plotting. At the same time, I’m not sure it says anything desperately profound about the world of the play. It’s strange. It at once feels a bit like an attack on the piece, and like some big Regietheater konzept, but at the same time like mostly just an enormous amplification of what’s already there, and no so very much critique. But maybe it’s not meant to be, and that would be fine. And, as I say, the beginning works so beautifully that you fall in love immediately. Act by act, walls from the set are flown out. So, from the closed room in which the play begins, the stage gradually becomes a vast empty(-ish) expanse by the final scene. The back wall covered by a low-hanging, hilariously tacky, airbrush-art picture of a pine forest that looks like it’s only missing a wolf from a biker t-shirt. The string quartet which accompany the action with edgy, staccato modernist stabs is visible. And to kill herself Hedda simply slips out under the hanging picture. While this is a lovely visual effect, I wondered if it really reflected the play terribly well. 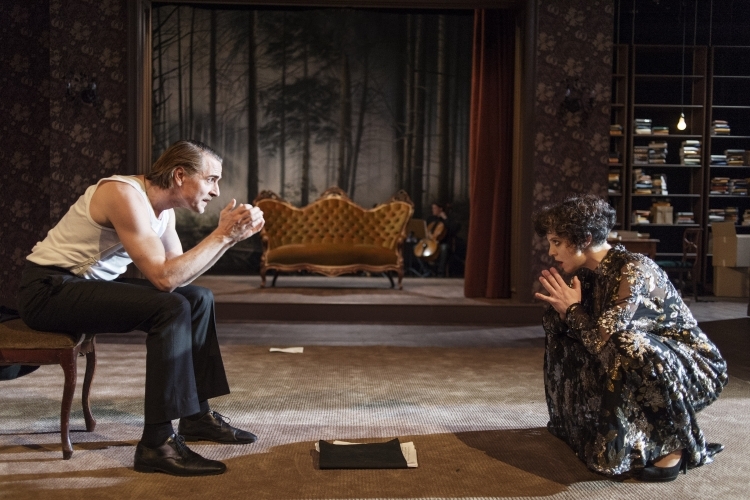 Is Hedda Gabler a play in which all the walls disappear? Isn’t it the precise reverse? Don’t more and more walls spring up until she can see no way out other than to shoot herself? On the other hand, perhaps, a) it would be crass to precisely mirror the narrative structure with the set, and, b) isn’t there also an attendant process of desolation going on for Hedda herself? Also, c) it does basically *feel* like the right decision. Perhaps not an at an intellectual level, but somewhere earthier. Ultimately, the production feels incredibly clever, but not quite clever enough. However the acting, the performances, the design, the music, even the lighting, are first class. And I reserve the right to come back in a week, once I have spent more time thinking about this production, and claim that actually it is doing something incredibly clever indeed, which I haven’t yet worked out because I’ve been too busy describing it to think about it. If I don’t, however, let the above stand as testament enough to my preparedness and desire to do so.